Lord Maha Vishnu in his 'meditation pose' is worshiped on this auspicious fourteenth day of the first phase (Shukla Paksha) of Bhadrapada maasa. 'Anantha' means 'endless' and it is believed that by praying maha vishnu in his 'seshashayana' (lord sleeping on snake bed) posture on this day brings an end to the sorrows of one's life. It is said that Yudhistira was advised by Lord Krishna to perform this vrata for 14 years during their period of vanavasa/exile. It is believed that Lord Vishnu blesses with happiness and prosperity when this vrata/prayer in ritualistic form when performed for 14 years followed by udyapane. Number 14 has lot of significance in this vrata. The sacred thread which is wore on this day has 14 knots or it is made of 14 layers, the neivedyam offered has 14 types of 'fruits' and 'bhakshyas' and each bhakshya is offered in 14 numbers. The altar is cleaned and Kalasha sthapane is done. Kalasha=A coconut placed on a pot of river water which is filled with dry grapes and gold coin. 14 betel leaves are placed in a round fashion and a coconut which is smeared with turmeric is placed on the betel leaves. A tilaka or Vermilion is placed on the coconut. This kalasha is decorated with garland and jewellary. 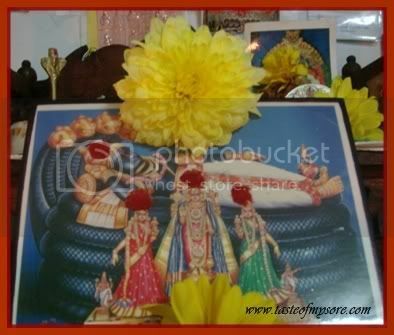 A similar pot for godess Mahalakshmi is made and both of them are worshipped with flowers and patre (leaves from flowering plants). Men tie the sacred red thread on right hand and women on left hand and worship Anantha. 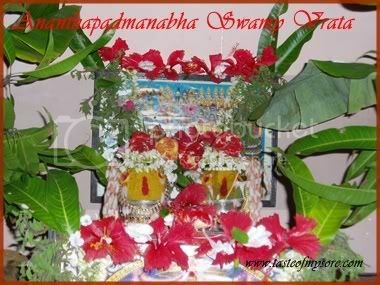 Vrata is concluded with the offering of neivedyam of various bhakshyas and phala/ fruit. 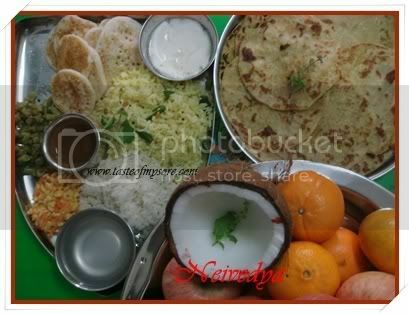 Different houses have different varieties of neivedyam offering. My mother-in law makes 14 Uddina dose/dosa (special about this vrata ..offering dosa neivedya) , 14 Holige, 14 Kajjaya, and a festive platter of Kosumbari (salad), Palya(stirfried vegetable), Chitranna (lemon rice), Anna (rice), Holige Saaru (rasam), Mosaru (curd), elaneeru (coconut water) and fruits (14 bananas). 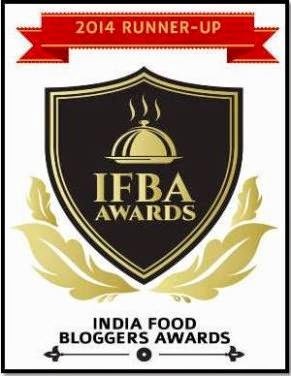 That's gud info..new Vrat for me too..thanks are so nice..
thanks for sharing something really new..the pooja decoration looks really good...And the food is superb too..so many varieties..
hi this is my first time here...i really liked ur blog. Thanks for the gr8 info. and the pics r so divine. Thanks for sharing it. I am pretty new to this blogsphere...jus popped in to say a big hi! Great Platter Lg ....Lovely Pooja Pics.Thanks for the info.. Very nice post, and vrata is new for me too. awesome snaps!!! vrata is new to me 2...lovly decorated pics....so as the dish.. The description and pictures are good. As in the tradition, there will be rangoli (design) laid on this day in front of the kalasha. That is called "Ananthana gantu" which means Anantha's knot. It is very complex design - not known by many, even to who perform this vratha. Please post it here if anyone knows how to draw "Ananthana gantu". I am really looking for it. Thanks for droping by and informing me about Ananthana Gantu. I will try to find it out from relatives when I visit India. If I get it I will definitely share the information with all. Here is the rangoli you were looking for. It was created by another ikolam member and her name happens to be Lakshmi too (Lakshmi devi). Thanks for the prompt response. I have left my coment. Can u just let me know udyapane procedurefor this?